1AW1007 1 ton 4' 10" to 7' 6" 4' 4" to 7' 11' 6" 4' to 10' 6"
1AW1009 1 ton 5' 10" to 9' 6" 5' 4" to 9' 11' 6" 4' to 10' 6"
1AW1010 1 ton 6' 4" to 10' 6" 5' 10" to 10' 11' 6" 4' to 10' 6"
1AW1012 1 ton 7' 4" to 12' 6" 6' 10" to 12' 11' 6" 4' to 10' 6"
1AW1014 1 ton 8' 4" to 14' 6" 7' 10" to 14' 11' 6" 4' to 10' 6"
2AW1007 2 tons 5' 2" to 7' 10" 4' 6" to 7' 2" 11' 6" 4' to 10' 6"
2AW1009 2 tons 6' 2" to 9' 10" 5' 6" to 9' 2" 11' 6" 4' to 10' 6"
2AW1010 2 tons 6' 8" to 10' 10" 6' to 10' 2" 11' 6" 4' to 10' 6"
2AW1012 2 tons 7' 8" to 12' 10" 7' to 12' 2" 11' 6" 4' to 10' 6"
2AW1014 2 tons 8' 8" to 14' 10" 8' to 14' 2" 11' 6" 4' to 10' 6"
3AW1007 3 tons 5' 2" to 7' 10" 4' 4" to 7' 11' 6" 4' to 10' 6"
3AW1009 3 tons 6' 2" to 9' 10" 5' 4" to 9' 11' 6" 4' to 10' 6"
3AW1010 3 tons 6' 8" to 10' 10" 5' 10" to 10' 11' 6" 4' to 10' 6"
3AW1012 3 tons 7' 8" to 12' 10" 6' 10" to 12' 11' 6" 4' to 10' 6"
3AW1014 3 tons 8' 8" to 14' 10" 7' 10" to 14' 11' 6" 4' to 10' 6"
Gantry cranes have certain specifications that you should be aware of as you consider adding them to your operations. What follows below is a brief explanation of these key specs with illustrations where possible. 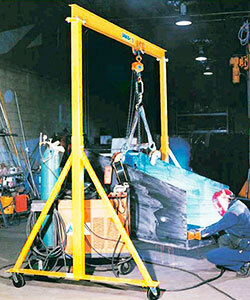 Capacity - The total load limit including weight of the hoist and trolley being used to lift and move the load. Overall Span - The total length of the horizontal I-beam that supports the load. It is a key factor in determining how wide your gantry crane will be. 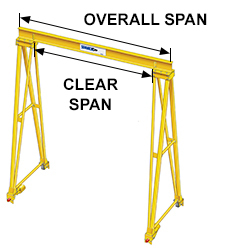 Clear Span - The length of the horizontal I-beam along which it is possible to move the load. Most cranes have clear spans somewhat shorter than the overall span because of the support framework holding up the beam. 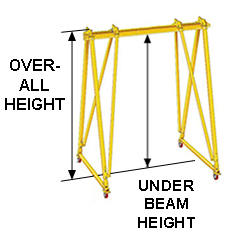 Under Beam Height - The distance from the floor to the bottom of the I-beam. To determine whether the available working space is sufficient for your project, add the height of the load, hoist and trolley headroom for the total distance from the lift surface to the bottom of the beam. If you will be loading from a table, workbench or conveyor, also add the height of the lifting surface to be sure the under-beam height will be high enough. Overall Height - The distance from the floor to the top of the crane assembly. Make sure the crane will clear overhead obstructions. Tread - The distance between the legs of the support framework at each end of the gantry crane. This is a key factor in how much depth you need for moving the gantry crane sideways. Wheel Span (Span Between Wheel Centers) - The distance between the two sets of wheels on the gantry crane. 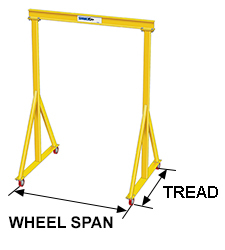 This measurement is important if you plan to run your gantry crane on a wheel track. Caster Diameter - The diameter of wheel used in the casters used on the gantry crane. Casters are always matched to the load capacity of the crane.